A newly-released report from Apartment List analyzes data from 6,400 surveyed millennials on their plans for homeownership. With Millennials are on the verge of surpassing Baby Boomers as the nation’s largest generation, the question of when and if they will purchase homes looms large over the housing market, especially for the Denver Metro area. While the overwhelming majority of those surveyed would like to purchase a home at some point in the future, far fewer are financially prepared to do so in the near term. There were several key takeaways from the report regarding Denver. 87% of millennial renters in the metro Denver area say that they plan to purchase a home at some point in the future, but just 5% expect to do so within the next year, while 28% say that they won’t buy for at least five years. This is bad news for the cheerleaders in the real estate industry who are banking on millennials to power home prices gains in 2019 after a lackluster year in 2018. Of those millennial renters in the metro Denver area who plan to purchase a home, 47% have zero down payment savings, while just 12% have saved $10,000 or more. The average home price in Denver metro at the end of the year for 2018 was $465,000 if you wanted to put a 20% downpayment that would be $93,000. As you can see millennials are way behind in terms of ownership prerequisites. 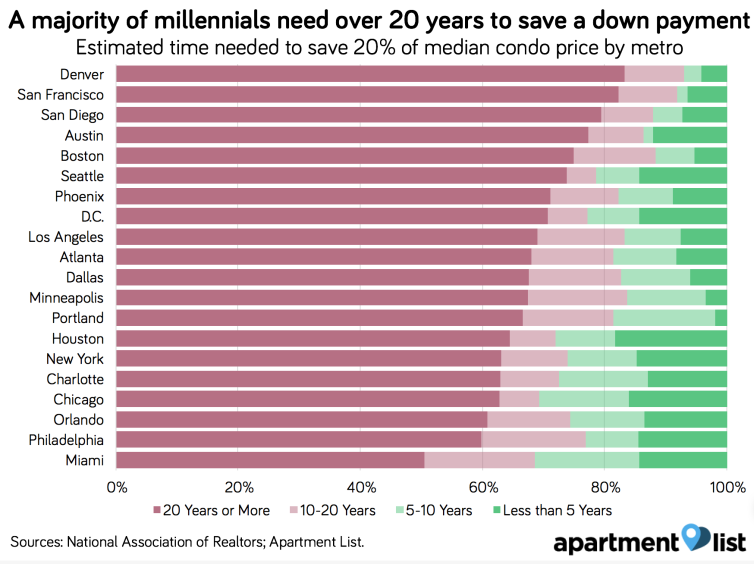 Our estimate is that 83% of prospective millennial homebuyers in Denver, CO will need more than two decades to save a 20% down payment on the median priced condo in their area. The graphic above shows Denver atop a list that you don't want to be first on. Another narrative for a strong rebound in home prices collapses with this report and we will see the output of January sales to see how the year starts next week.